Some people only bring a pad of paper, a pen or pencil and something to drink when they attend a meeting. What if that meeting is being held in a superfortress flying hundreds of miles out at sea? A volcano could come out of nowhere and send that meeting crashing down into the water at a moments notice. 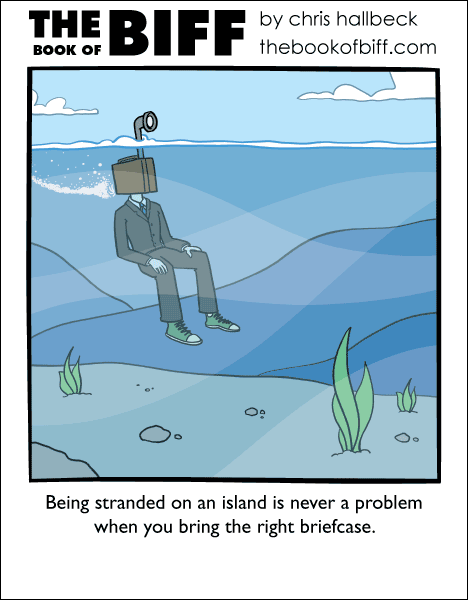 Be prepared and carry the proper briefcase for the environment you will be in as you are falling asleep to pie charts. I am so jealous right now. Some spies have called for the termination of this particular gadget owing to cases of neck excision and breathing difficulties. However, since Biff has sustained many debilitating injuries to the face in the past, it would surely not effect his spying prowess. Oh, that one really hit my funny bone! Well done! Biff has a briefcase, and a suit case, but does he have a basket case? @Reynard Surely there’s a difference between a flotation travel bag and a submarine briefcase. We all live in a yellow submarine…. a yellow submarine… a yellow submarine…. OK, now this time, you’ve ‘out-Q’d’ Q. Maybe you should sell the idea to whoever writes the James Bond movies. I’ve noticed that all the comics this week have had Biff wearing a suit. I still think it’s Gadget or Spy week. They’ve all involved a special device of some sort. Special Mission Noodles, Rocket Belt, and now a Submarine Briefcase. For my two cents, I think Reynard’s version is better, because not all of us have necks that can be crushed to the extent that they can be fitted inside closed suitcases. @ Gwid: It wasn’t my idea. Just wanted to point out that something similar had already been invented.